At the start of November, I decided to become a vegetarian for a month, in aid of Cancer Research, and also to see how I liked it. November has now been and gone, and I remain vegetarian! Augustinas stuck to the meat-free November with me, but he is now back eating meat and fish but at a hugely reduced amount. I honestly found no down sides throughout the month. I expected to crave meat but that really wasn’t the case. My diet is still super varied, it isn’t difficult to find good vegetarian options and I generally felt better without eating meat. I’m not sure it will last forever, but for now I’m enjoying it. We’ve tried to visit Make No Bones once before but it was so popular and busy that unfortunately we couldn’t grab a table that day. This time we planned ahead and booked a table. I was so excited when the time finally came to try out the food that I’ve heard so many great things about! 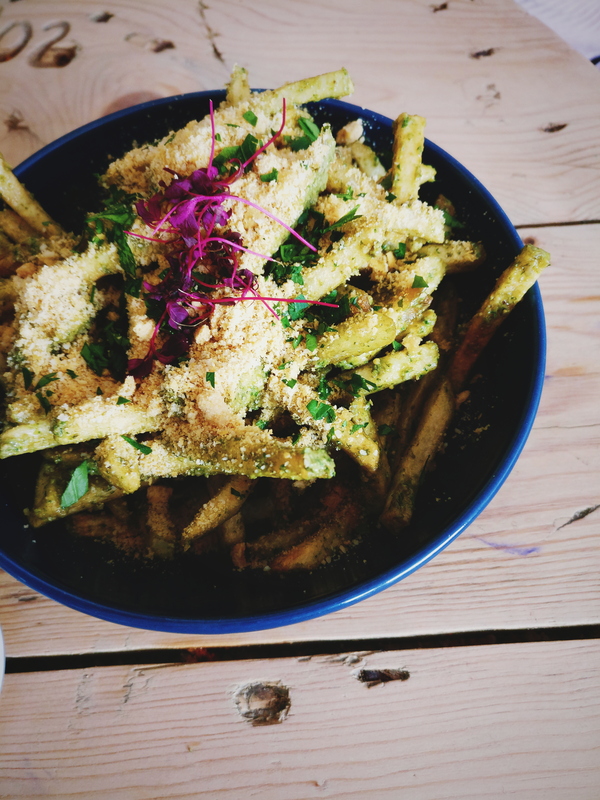 We grabbed some pesto Parmesan fries between us (vegan Parmesan… just how?) and I ordered the chicken tikka flatbread wrap. Augustinas had the stew, which was filled with bacon and cheese dumplings. Seriously – how do they create this with no animal products whatsoever?! My mind was pretty blown. The pesto Parmesan fries (£4) were great. If you fancy some other sides, they serve avocado wings, ribs, onion rings and more. You’re pretty spoiled for choice, actually. 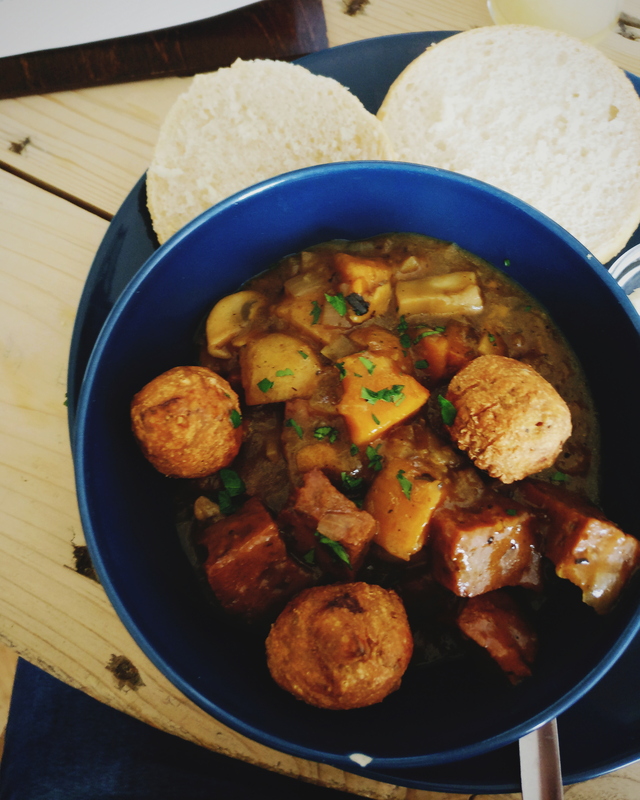 Augustinas’ stew was a conundrum. The sauce tasted so rich and so meaty, I have no clue how they made it. The aubergine, mushrooms and sweet potatoes in it were tasty and the dumplings were crispy and well seasoned. It was served with bread for dipping. A really hearty, filling meal that was so smooth and richly seasoned. Total crowd pleaser and I would love to have it again! Though on my next visit I would definitely be tempted by their mixed grill. The lady on the table next to us had it and it looked insanely good. My flatbread was equally delicious. The “chicken” was chewy, a little spicy and crunchy at the same time. The vegetables were crunchy and the mint sauce brought it all together. 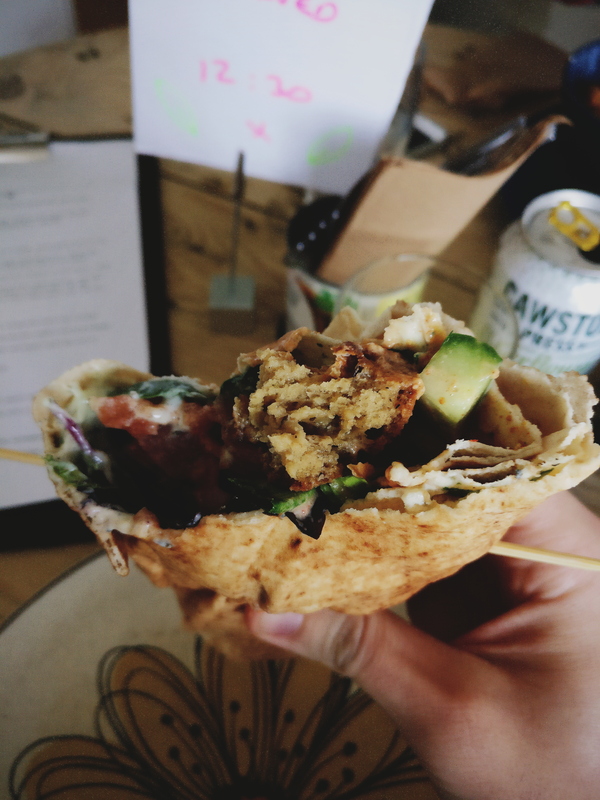 The wrap itself was huge and I was so full by the end of it (but we didn’t have any leftovers though, obviously). The vibe was very casual and it was lots of friends meeting up to grab a quick meal. 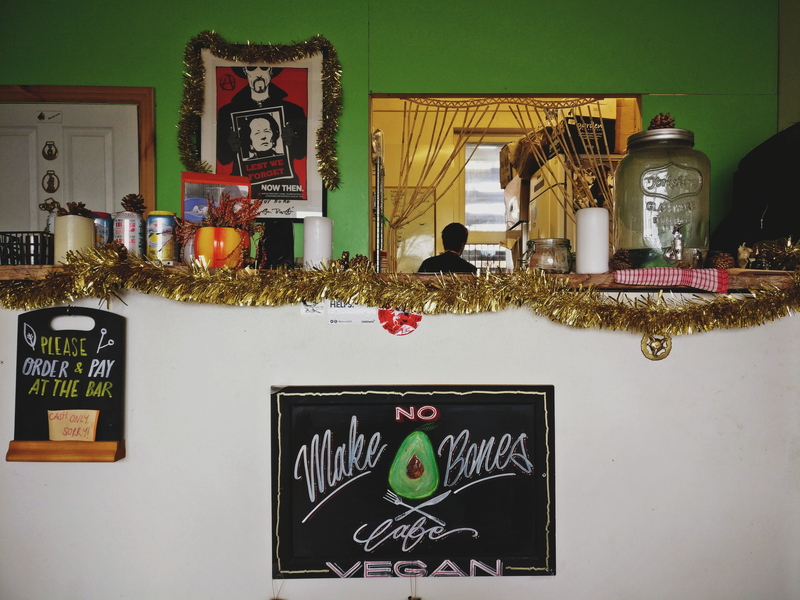 You could almost mistake it for a sandwich shop rather than a cafe that serves main meals. I quite like that no one bothered us though. We ate our delicious food in peace and made our way on. 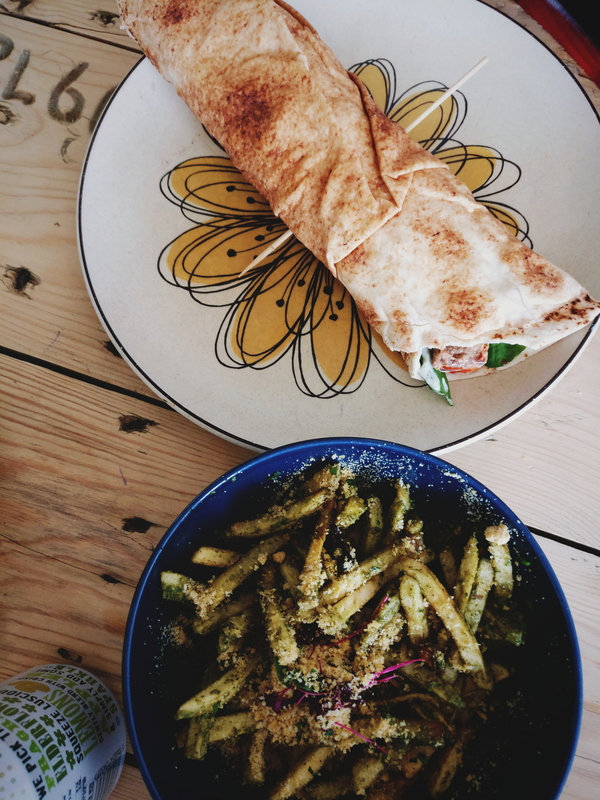 Verdict – very relaxed and casual, reasonably priced food, varied menu, and it will totally change your perspective on vegan food. Do not underestimate how delicious, filling and top quality this food is! You must go try it. Just make sure to book a table.